A political power play like no other in Canadian history, Christopher Hunt as Pierre Trudeau (left) lays it all on the table for a discouraged Philip Riccio as Joe Clark (right) to making a point that public life is all about poise and position if you want to win over the majority. 1979 is a funny inside look at a system that governs us all. A fact’s a fact: This world is made up winners and losers with few people going down in a House of Common’s hick-up like Progressive Conservative leader and Canada’s illustrious #16 Joe Cark did four decades ago. Laughing stock of the official opposition? Maybe. Distinguished do gooder committed to democratic deeds. Definitely. But, hey, bad decisions happen. And the man who could have delayed a vote to buy him more time in the Prime Minister’s office took the moral high road thereby engineering his own defeat. 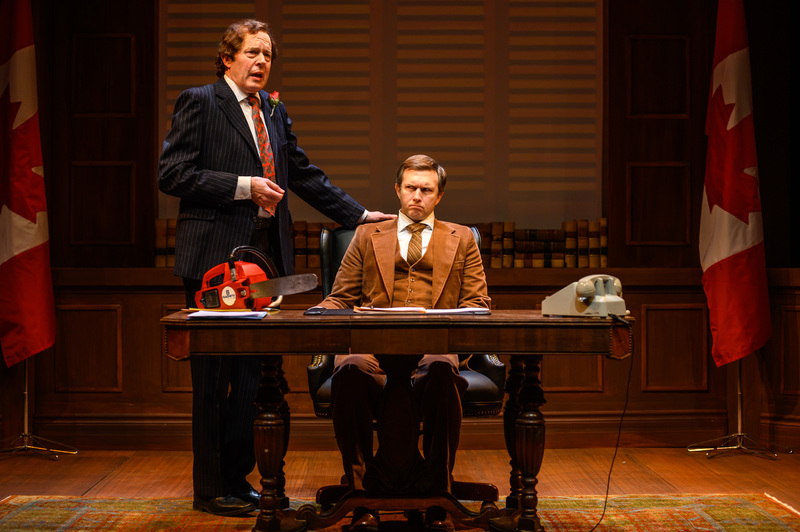 1979 is the play satire phenom Michael Healey needed to deliver for contemporary audiences to underscore the hilarious back biting nature of those we put in office. Not only does his flair for intellectual realism shine like a thousand points of light, his survival of the weakest plot points trigger a landslide of laughter in almost every scene. This is, after all, the true tale of a party 6 members shy of a majority, 6 months into power with 6 M.P.s nowhere in sight on the evening of a critical vote on a ‘short term pain for long term gain’ budget vote. Should the nays out number the yays, this not-so-average Joe could soon be packing his bags back to Alberta. Christopher Hunt is absolutely striking as a the paranoid John Crombie and the arrogant Pierre Elliott Trudeau. When it comes time for Liberal leader’s epiphany that he can’t quit and must return to save Canada from the looming threat of separatism, you can’t help but go wide eyed that maybe this was the best thing for nation. That’s not to say Jamie Konchak doesn’t have her showstopper moments specifically as a starry eyed young Stephen Harper pontificating a future vision of politics with a bunny and a fox metaphor to help the freshly elected Tory see truth for what it is. The play leaves it up to a righteous Philip Riccio to secure a Clarkian dialect in a portrait of a figure whose objective of self-preservation just doesn’t seem to be a priority. You cheer for the character, you’re sad for his situation, you can help but wish he lives to see another political day. It goes without saying the key take away from this calculated comedy is that politics is downright pooh. Let’s hope playwright Michael Healey’s keeping his note pad full of Justin Trudeau’s hits and misses for a brilliant follow-up in the years to come.